I would like to welcome the very talented Jennifer Ingram, interior designer and owner of Gracious Spaces, to the blog today. 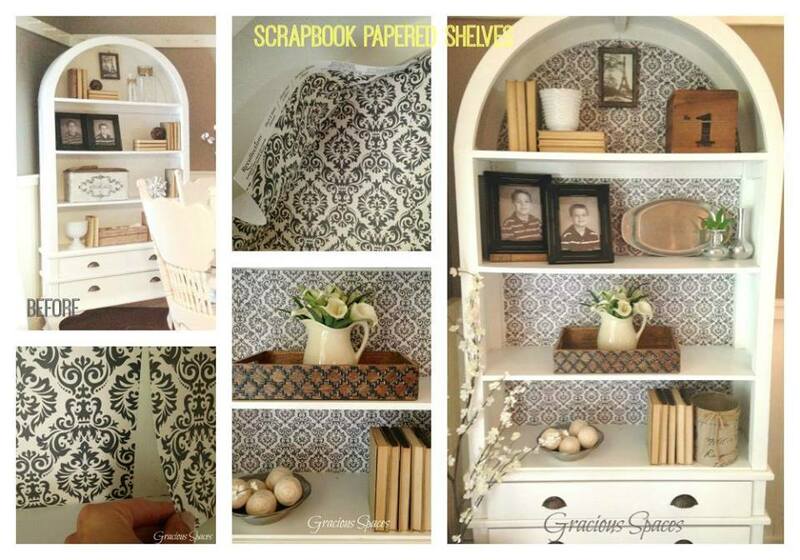 Jennifer has graciously accepted to share her DIY Scrapbook Paper Shelves tutorial with us. I love how Jennifer’s unit turned out…looking forward to trying this myself. I recently came to the conclusion that this charming, white bookcase in my kitchen was in serious need of some color, pattern, or personality. As much as I like white in my home, I was finding that it was lacking interest. I decided to visit my local Michael’s craft store in search of something to line the back shelves with. I found their oversized scrapbook paper and looked for different options that would complement my kitchen. I settled on a dark gray damask pattern that would pop off the shelves while not limiting changes I might want to make in the room over time. I purchased 12 sheets of scrapbook paper at .79/each. The back of my shelves were sticky from a contact paper application that I tried years ago. So my paper literally stuck right on to the back of the shelves. You will want to purchase either spray adhesive, double sided tape, or even scotch tape to adhere your paper to the shelves. Measure your shelves and decide where you want to place your first sheet. Remember to cut so that the next sheet lines up with the one before so you have a clean, seamless background and then smooth out your paper. Trim out the edges with an x-acto knife or sharp scissors to get a precise cut around the excess paper that is left. For as little as $12 you can have a quick, custom look that will dress up a basic bookshelf in less than an hour. Give thought to the books and accessories you use to decorate the shelf. 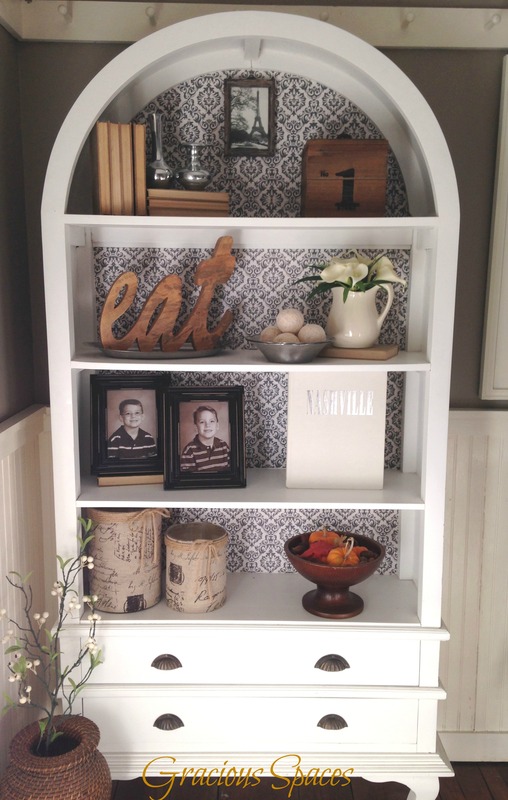 Use items that complement the paper and resist over-decorating the space. 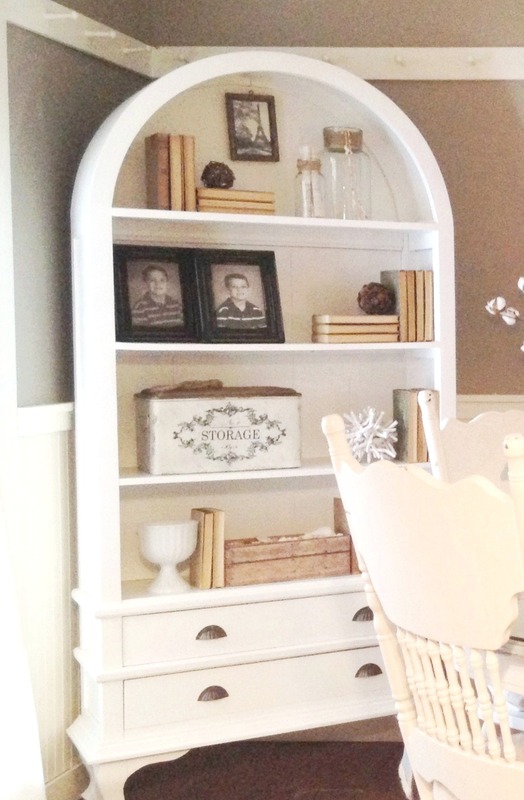 This DIY hack is such a cost-effective way to make built-ins, bookshelves, and the back of cabinets look custom. This treatment is also a clever way to decorate the shelving unit around a television. Wallpaper, contact paper, and fabric are also great choices that can be applied giving the same effect. I love the result! Be sure to check out Jennifer’s work at Gracious Spaces and follow her on Facebook! Thanks Jennifer! The bookcase came out fabulous. I am looking forward to doing the same on mine. Thanks so much for asking me to share, Margaret! I love an easy, affordable DIY project. Looking forward to learning more from you here on your fabulous blog!! Thanks Kim. Jennifer is very clever. She did another post for me a while ago, her chandelier transformation…it too was amazing and easy to do. Margaret – what a great idea! So economic and the final look just makes it POP! Love this post! Have a great day!